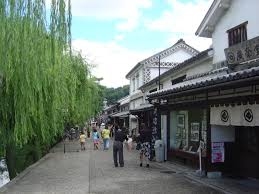 Okayama, the capital city of Okayama Prefecture in the Chūgoku region of Japan, is a well-known city you should visit. Okayama Castle, otherwise known as crow castle because of its black exterior in contrast to the white castle located one prefecture over, in Himeji that is called Egret Castle. To reach the castle, you can exit Okayama train station, and walk down the main street Momotaro-odori Street and the castle will be located at the end of the main street right next to the gardens. If you prefer the tram also stops in front of train station and will run down Mototaro-odori Street all the way to the castle and gardens. Okayama Garden, or Kōraku-en is one of the top 3 gardens in all of Japan where you can easily spend an entire day wandering the garden paths that lead to Okayama Castle. Within the gardens there are spots to rest and soak you feet, or shady spots to try delicious ice cream flavors such as sesame or peach. Take the local train from Okayama Station to Kurashiki which is 10 minutes away, to find a beautiful old merchant shopping area with a central canal. It is the perfect place to wander stores selling traditional Japanese goods and cafes. If time allows make sure to check out the Ohara Muesum of Art that was Japan's first museum for Western art that features Monet, Matisse, Gauguin, and Renoir.